Some of my clients have walked the red carpet at the Golden Globes, Academy Awards and SAG Awards. You don't have to be a movie star to train with me, just have the desire to live a healthier life. Now is the time to get healthy and fit! There is a reason why I win awards each year for my personal training program. Unlike other trainers, I combine exercise with nutrition in a way that is completely unique. You won't find a program like mine anywhere else in Minnesota. I specialize in weight loss, but I can help you with all your fitness needs. Get your training started right with one of my training packages. Please check out my testimonials and then call me at 952-828-5594 today for your totally free consultation and for information about special package rates! I want to thank you for stopping by my site. By simply coming to my site, you have taken the first step in reaching your health and fitness goals. My name is Swen Corbin and I have been a personal trainer for over 20 years and have been running my fitness business for over 15 years. I have helped over 1,000 Minnesotans reach their health and fitness goals. I work with men and women of all ages and body types. My special blend of training and nutritional counseling has helped get me voted "Best Twin Cities Personal Training" the last 2 years by Citysearch.com. Please come in for a free consultation and let's see how I can help you. I'm proud to bring my clients a brand new location for personal training. My new location is located near 169 and 494. 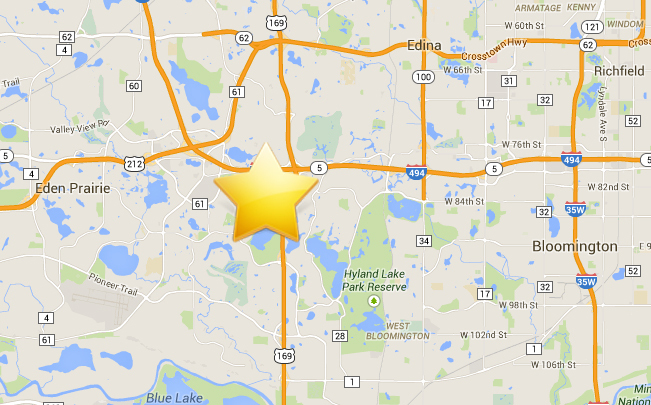 It is just minutes from downtown Minneapolis, Edina, Plymouth, Eden Prairie and more. "When I worked at the health clubs, I would constantly see people doing exercises incorrectly or they would not push themselves hard enough to see the results they were looking for. Eventually they would get frustrated and quit the gym. I would always think to myself, if that person only had my knowledge and the right assistance they would definitely get the results they are looking for. One of the great things about my training is the privacy. When you come in for a session you will not have the intimidation of a big gym. Let's face it, the gym can leave a bad taste in your mouth. You are working out and it feels like everyone is watching you. Getting into shape is hard enough without a bunch of strangers judging your every move. Some of my clients just work with me for a short time. They see great results and then go on their own. Some of my clients work with me for years because they love how I keep them in great shape and motivated. Which ever type of client you are is fine, just remember the knowledge of how to get into shape the right way will last a lifetime." Come in Now for a consultation! Work out one on one or bring a friend. Group sessions can be fun and are a great way to save money. You can work out privately at the Body Sculptor Fitness Studio. Get a workout and a nutritional program guaranteed to change your life forever. Contact me to discuss my package rates on private personal training in the Twin Cities. I have many options available.